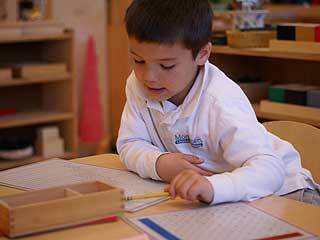 Our Program follows a Montessori curriculum throughout. The classroom environments are designed to serve the developmental needs of children and to accommodate children of mixed ages while respecting and nurturing the individuals who make up the classroom communities. The Montessori method is one that has been time-tested for over 100 years and has achieved success throughout the world. 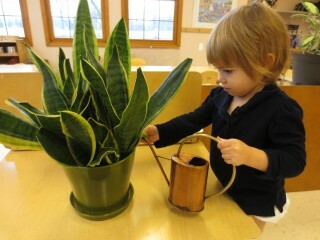 In the Montessori classroom, the child learns through discovery and is motivated by her/his own interest and excitement. In this atmosphere, the child develops a positive self-image and experiences the satisfaction of success. The joy and enthusiasm for learning that are fostered here build a strong foundation for later education and for life itself. A nurturing environment for children 8 weeks through approximately 33 months of age. The highly-ordered environment in the Nest allows the little ones to explore, to refine motor skills, to increase language, and to move toward independence in a safe, warm, stable environment. A special place for children ages 3 through 6 (Kindergarten). The individual development of each child is nurtured as they all learn to be respectful members of their community. 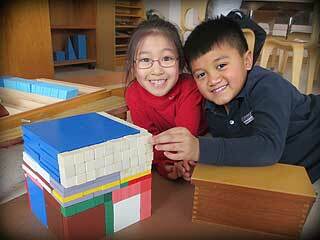 They are engaged in a variety of social, physical and intellectual hands-on activities. A room filled with activities designed specifically for children ages 6 through 12 (1st through 6th grade). The work begins moving from the concrete to the abstract.